All have Sterling Silver fittings. 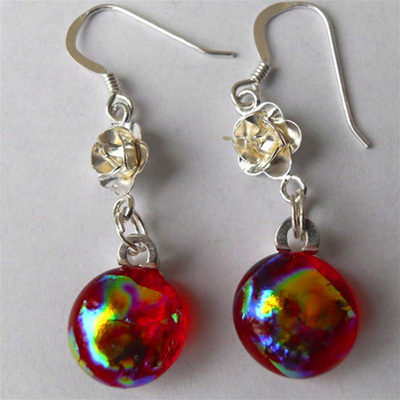 Very pretty light Amber Dichroic glass earrings with round shiny silver connectors. 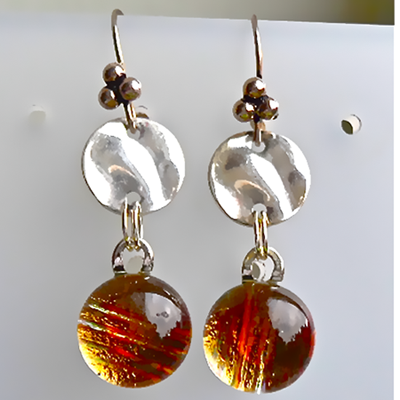 Bright Gold, Mustard Dichroic glass earrings with plated silver diamond shaped attachments. 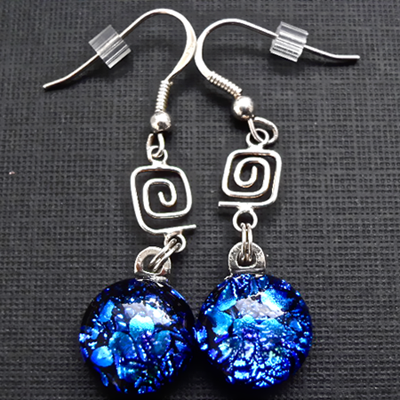 These very striking earrings have plated Silver swirls attached to Cobalt Blue textured Dichroic glass pieces. There is a matching ring. 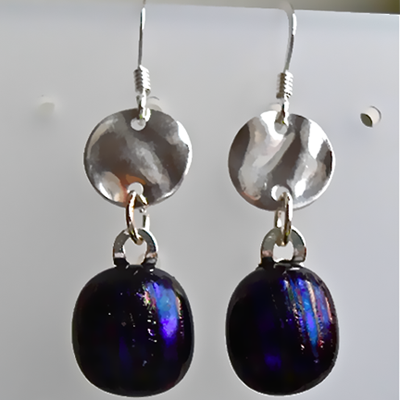 Very dark Purple textured Dichroic glass earrings with round shiny silver connectors. 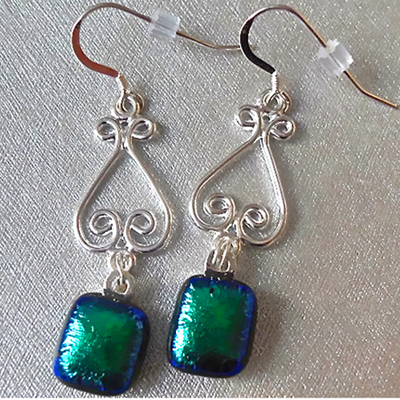 These earrings are made of small squares of very deep Green with a Purple hue Dichroic glass with ornate plated silver attachments. 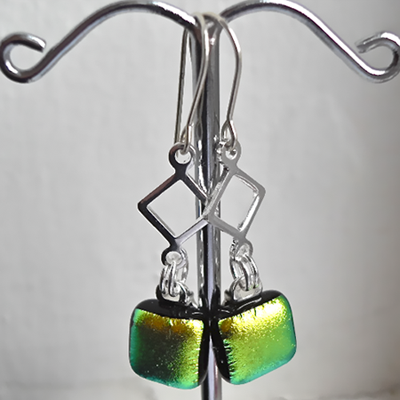 Another pair of Emerald Green Dichroic glass earrings, this time with a blob of Gold/Orange textured Dichroic glass on top. 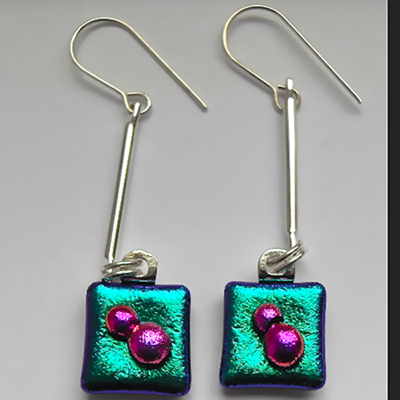 An unusual combination of colours in these Dichroic glass earrings, Emerald Green and Magenta. 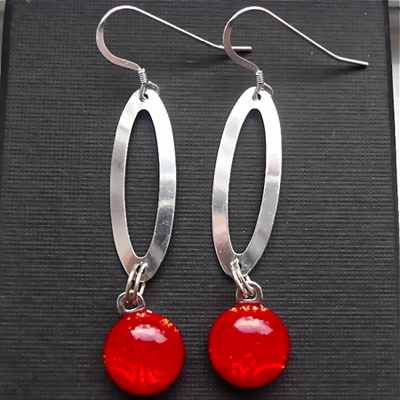 A brand new design. 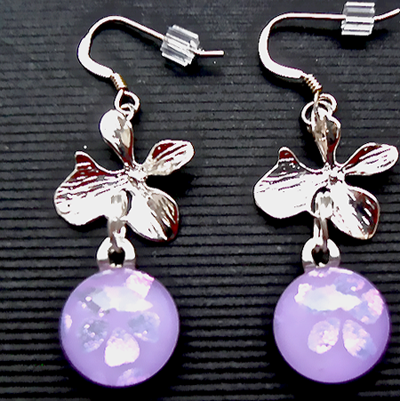 Very pretty Lilac with a Pink flower Dichroic glass earrings with silver orchid shape attachments. 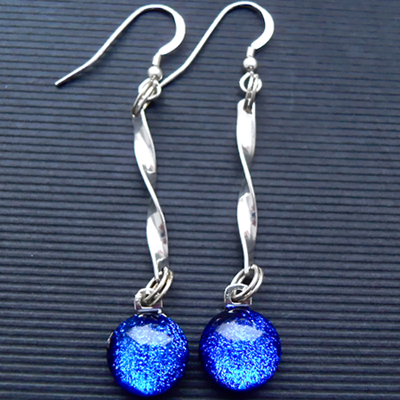 Delicate longer earrings. 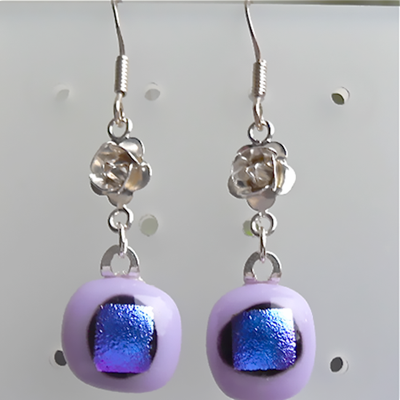 Lilac with a Pink flower Dichroic glass. 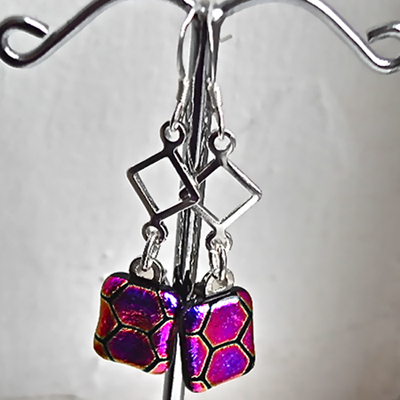 Magenta/Black/Gold honeycomb patterned Dichroic glass earrings with silver diamond shaped attachments. 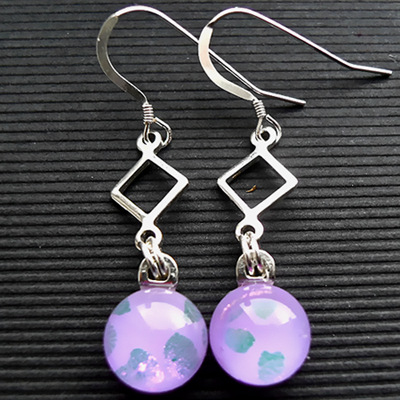 These earrings have a pretty little silver rose attached to the piece of opaque Pale Lilac and Purple Dichroic glass. There is also a stud version. 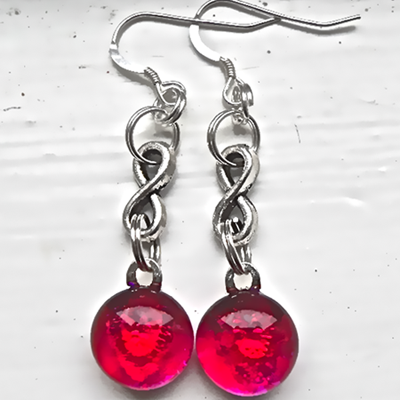 These pink earrings have a plated silver small infinity symbol attachment. A brand new design. 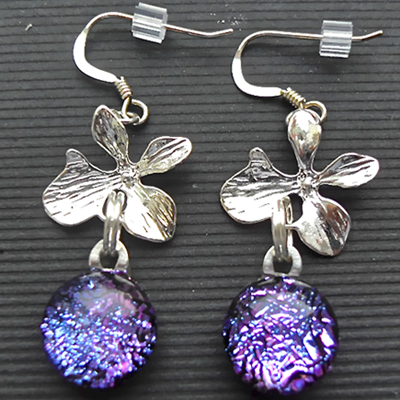 Very pretty Purple/Black crackled effect Dichroic glass earrings with plated silver orchid shape attachments. 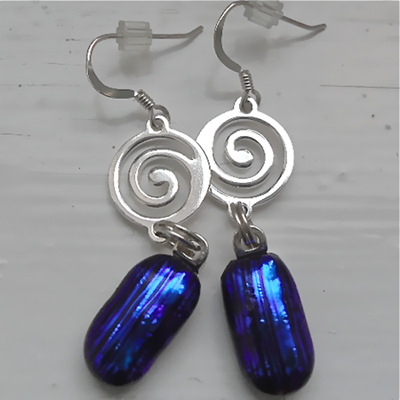 Another pair of new design earrings. They have long plated silver attachments. 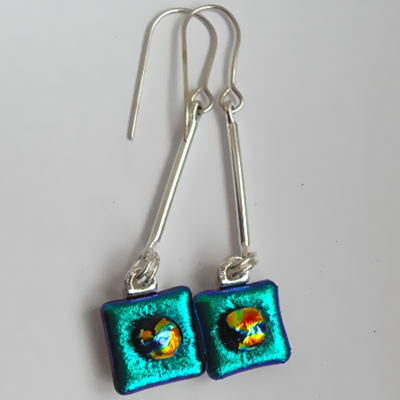 These earrings have a very pretty little silver rose attached to the Dichroic glass piece. The colour shifts according to the light. There is also a stud version and a matching bangle. 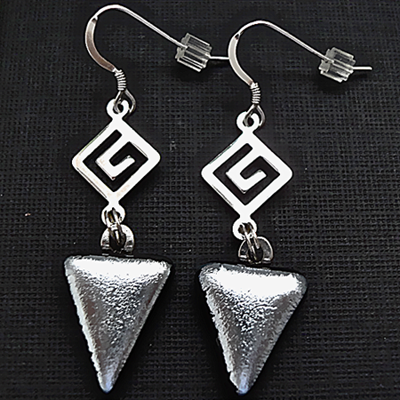 These striking longer earrings are made of Silver triangles of Dichroic glass with plated silver attachments. 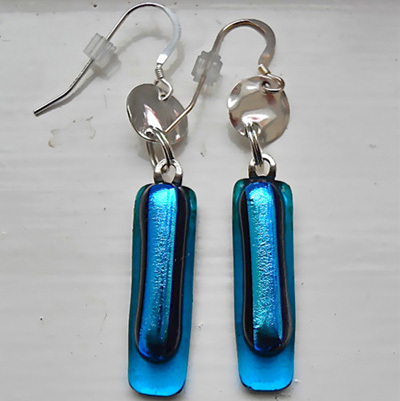 Sky Blue Dichroic glass longer earrings with Sterling Silver attachments.